A history of the Francis family, descendants of Henry & Ruth Francis, in Australia. "Henry Francis - Gentleman of Cumberland Street" is for all those interested in the lives people led in mid-19th century New South Wales. The social activities they enjoyed, as well as the triumphs and disappointments of their daily lives. The book draws on family diaries and letters to give an insight into the lives of Henry and Ruth Francis and their family, who arrived at Sydney as free settlers in 1832. It is of particular interest to the descendants of Henry and Ruth, including members of the Francis, Simpson, Suttor, Bowler, Edols, Griffin, Everett, Armstrong, Bryant, Hart, Curry, Powell, Nairne and other associated families. 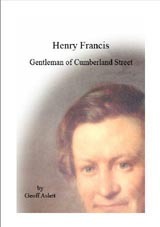 First published in 2000, "Henry Francis, Gentleman of Cumberland Street" is now released as an ebook in response to the requests for copies, over the years, since the first release sold out.